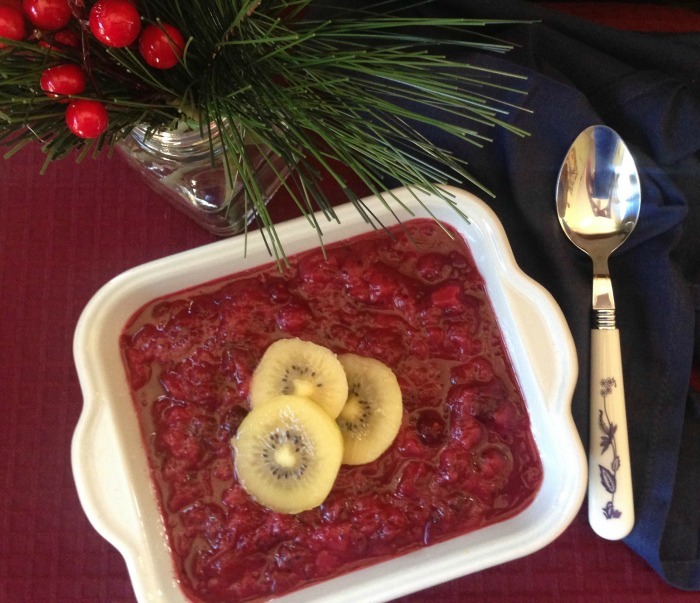 | Healthy Living Articles | Food and Meals | So Sweet Kiwi Cranberry Sauce & Syrup! 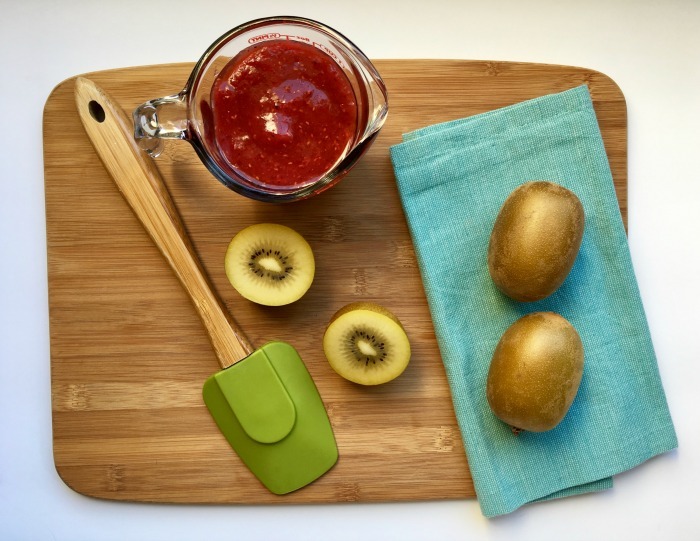 If you’re looking for a new healthy dish to add to your holiday meals, this kiwi cranberry sauce and syrup are quick and delicious dishes to make! The holidays are all about music, mistletoe, and making memories with the ones you hold near and dear to your heart. That’s why this Yuletide season, we’re proposing a kitchen challenge to rummage through your cupboards and ditch the cans! Since you’re already devoting time and attention to cooking a big golden turkey in the oven, why not take a couple minutes more to throw some cranberries in a saucepan, heat them, and serve homemade kiwi cranberry sauce alongside your tasty bird? You won’t be disappointed with the rich, hearty flavor that only using fresh cranberries can impart, and you certainly won’t regret the time you share with your family while you chop, smash, and splash in the kitchen! What Makes This Sauce & Syrup Special? 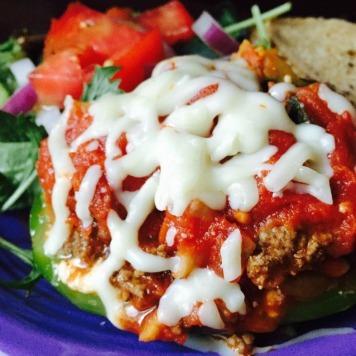 Toss out your wiggly, ribbed store-bought sauce and create a homemade dish to truly savor! 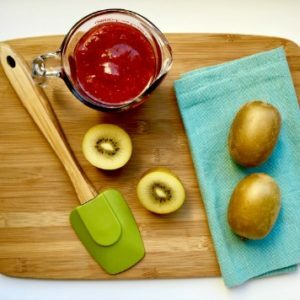 This Kiwi Cranberry Sauce is something uniquely mouthwatering because it has juicy, plump Zespri SunGold Kiwifruit! The addition of this delicious superfruit lends a crisp, zesty flavor that lingers in your mouth long after the last spoonful is devoured. The kiwifruit, along with a splash of refreshing orange juice and a pinch of warming cinnamon, makes this sauce totally share-able (but we won’t judge if you decide eating it is a one-person job)! PS: If you’ve already stocked up on canned cranberry sauce, why not toss it into a donation box and give it to a family in need?! 4 SunGold Zespri kiwifruit, peeled and diced (let the kids dice the kiwi -younger kids can use plastic knives) See the Super Crew age guide for cooking. 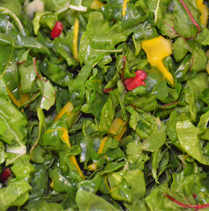 Place juice and all remaining ingredients except cranberries in a small saucepan over medium-high heat. Simmer, stirring frequently, until sugar is dissolved. If you’ve got a whole house full of guests over the holidays and you’re stumped on breakfast ideas, look no further than this thick, sweet, and satisfying syrup– it’s the antidote to grumbling tummies! Plain ole maple syrup is so last year, this season we’re obsessing over Berry Kiwifruit Syrup! Made with ripe Zespri SunGold Kiwifruit brimming with luscious tropical flavor, this is one excuse where it’s A-Okay to get saucy. Feel free to pour this heavenly mixture on top of a big stack of pancakes before you open all those presents underneath the tree. You could drizzle it over a bowl of steaming oats first thing in the morning. Or just whirl it into some creamy yogurt for a quick snack on the go. Either way, using up leftover fruit from another recipe has never been so easy and so amazingly delish. This recipe is perfect for 100% whole grain pancakes or plain unsweetened yogurt. Combine all ingredients in a blender and puree until smooth. Swirl into yogurt, use it as a topping for oatmeal, or pour it over a stack of pancakes.